David K. Leff is an essayist, Pushcart Prize-nominated poet, and former deputy commissioner of the Connecticut Department of Environmental Protection. 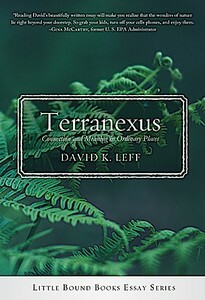 In his latest book, Terranexus: Connection and Meaning in Ordinary Places, Leff suggests that we connect with ordinary places close to home and discover inspiration and beauty nearby. Through "the art of deep travel," he understands that intrigue and wonder beckon just beyond our doorsteps. To learn more, join Bethel's Byrd's Books on Friday, November 30 from 6:30 - 8:30 p.m. for an evening that will remind us how important spending time with nature is for all of us on Earth. As David returns to Byrd’s Books to read from and discuss his new book, the latest in the Little Bound Book series from Midpoint Trade Books, he'll walk you just beyond your doorstep and make you realize that the wonders of nature lie right there. "So grab your kids, turn off your cellphones, and enjoy them," says former U. S. EPA Administrator, Gina McCarthy, in response. To save a spot for this unique adventure, or to order a copy of Terranexus, click here. Howard Mansfield, author of Dwelling in Possibility is direct in his acknowledgment of Leff's unique viewpoint and urgency. "Leff has given us a permission slip and a directive: go forth and see," he notes, adding "Travel local, travel deep. See the beauty in ‘hard-used places.’ Canoe polluted and pillaged rivers. Everything ordinary is beautiful. Go forth and make your own terranexus, your own ‘profound connection’ to your home ground. Celebrate your place in earth–there is no other like it." David K. Leff is the author of five nonfiction books, three volumes of poetry and a novel in verse. In 2016-2017 the National Park Service appointed him poet-in-residence for the New England National Scenic Trail (NET). Leff’s journals, correspondence, and other papers are archived at the University of Massachusetts Libraries in Amherst. He is the town historian and town meeting moderator of Canton, Connecticut where he also served 26 years as a volunteer firefighter. For more about Leff, click here.